Accra, Ghana – On February 20, the NetMark project team had the opportunity to host the first ladies of the US and Ghana, Mrs. Bush and Mrs. Kuofor, as well as American Idol winner Jordin Sparks during a visit to the Maamobi Polyclinic of Greater Accra. During their visit they got a closer look at the unique intervention being carried out by NetMark, which is supported by USAID under the President’s Malaria Initiative, to combat malaria by increasing the availability and affordability of life-saving insecticide-treated bed nets (ITNs) in coordination with Ghana’s commercial sector. 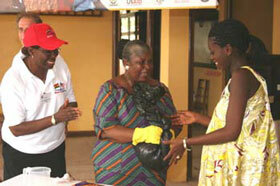 Led by NetMark’s Joseph Addo-Yobo and Juan Manual Urrutia, the group re-treated bed nets with insecticide and presented them to four pregnant women. Pregnant women and young children are most vulnerable to malaria, which is transmitted by night-biting mosquitoes and which can be simply and effectively prevented by sleeping under an ITN. 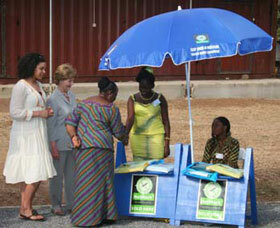 Mrs. Bush, Mrs. Kuofor, and Ms. Sparks also met with local "umbrella ladies." These women, who are essential to NetMark’s efforts to make ITNs readily available to at-risk populations, sell insecticide-treated bed nets from stands under large umbrellas. 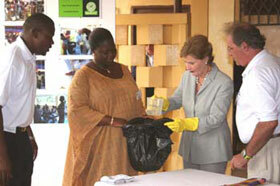 Read a transcript of Mrs. Bush’s remarks at the Maamobi Polyclinic in Accra.